It's almost the weekend! We went last night to meet the teacher night at my girls school. It's going to be a little sad here on Monday as Alivia is going in the 5th grade (where did the time go??) and my twins Madison & McKenzie start kindergarten. It will be quiet around the house without my girls. I have been so use to them being home with me. I will go and volunteer in their classroom every once in awhile. I made this card yesterday with school in mind. It's a shaped card cut out of the Wild Card 2 cartridge. I don't have a gypsy (yet) so this is a tablet of paper and what goes better with paper then crayons and a pencil. The crayons are on an action wobble. My girls just love it when something wobbles! I added glossy accents to the eraser. I felt the crayons needed a little something so I added some Studio G glitter glue to the tips. Wild Card 2 @ 4.5"
Very fun card. Love the wobble and the fun glitter touch. I love this card, it is so darn cute!! 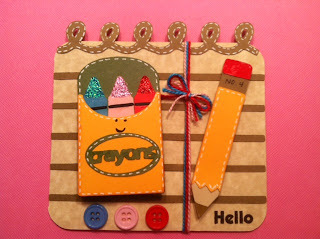 Love the glitter on the crayons and the pencil!!! It is so sad when they go back to school and the time just flies!! Our oldest is going to be a Senior in High School, I swear he just entered Kindergarten!! Fantastic card. 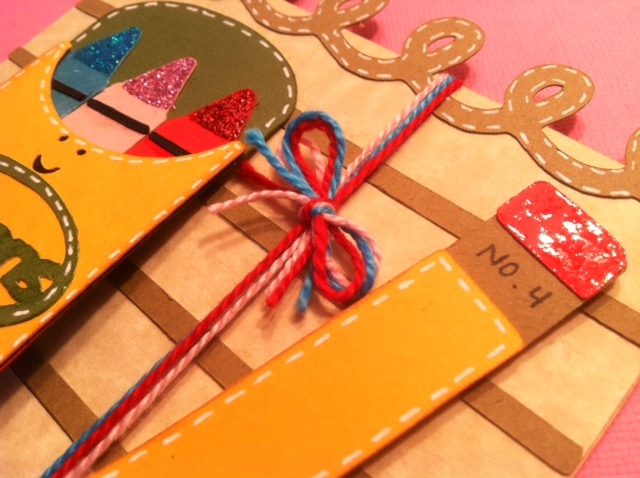 I love how you embellished the crayons with the glitter and the tip of the eraser with the glossy accents. Great design. Hope your kids have a great school year. Just think of the craft time you'll gain while they're at school! :) Thanks for playing along at CCC. Oh my goodness..this is sooo cute! 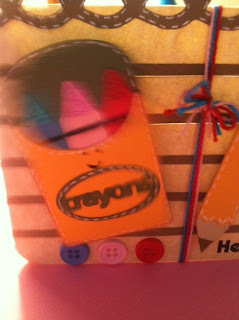 Love the adorable little crayons!! On how I remember the first day of school. It has been many years but I never felt so lonely. My daughter will be experiencing this on the 13th. Cute little card too cute. Love the all the details to the crayons and pencil. What an Adorable Card! 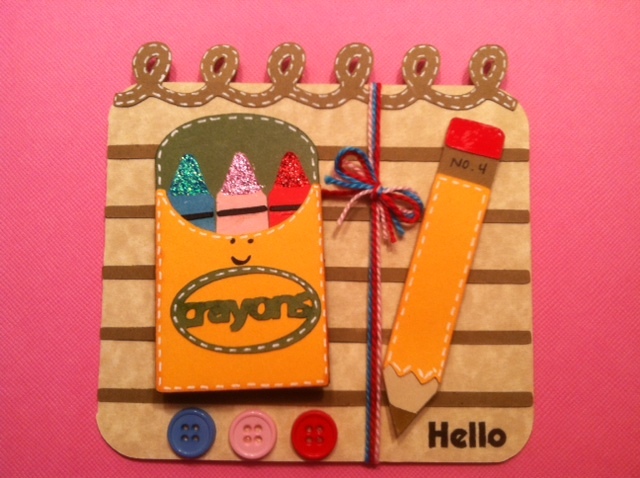 !Love the Crayons and Pencil...so sweet! OMG!!! I love your card!! Hi Tara! Thanks you so much for coming over to my blog, entering the giveaway, and becoming a follower! I actually already do follow you guys...I've been one for quite a while now! I'm just a quiet one sometimes...sorry bout that! I always like coming here to see all the purple!!! Wow, this is just the cutest card, the action wobble just tops it off, thanks for joining CCC! Thanks so much for joining CCC! I just LOVE your cute card! I am loving that you put it on an Action Wobble. I need to get me some of those... 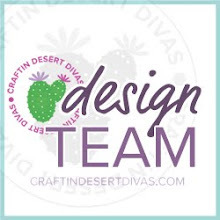 Thanks for playing with us at Cricut Cardz Challenge at Cardz TV :) Hope to see you again soon! This is so cute! I love how you put the crayons on an action wobble! So fun! 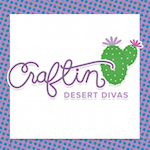 Thanks so much for joining us at Krafty Girls! Super cute card! Love everything about it. The Crayons are so cute on their Wobble...love the Wobbles. You did an amazing job. Came from Wobble Wed Challenge. I like how you made one of the cards look like a kid!, The Top made it look like the crayon is wearing a hat, really cute such creativity! Thanks for sharing your inspirations w/all of us!